There has been a considerable amount of gold mined in San Diego County, with the height of mining activity taking place from 1869 through 1940. Several hundred thousand ounces in gold has been reportedly discovered, although much of the gold mined during the early days went unreported. Most of these production numbers are from lode gold occurrences while minor amounts of placer deposits were also found. There are still gold prospectors in the San Diego area who are finding gold nuggets successfully using metal detectors and drywashers. This dry desert hides good amounts of gold if you know where to look for it. Pine Valley district is located in south-central San Diego County and lies about 35 miles to the east of San Diego. It also includes the Descanso area. A number of small lode gold mines existing in the area were first worked around 1900. A few of these have been prospected since. The deposits usually consist of parallel quartz veins which contain native gold. Deposits found here are found at shallow depths, few at depths greater than 150 feet. Perhaps searching for small prospects and and scanning the lode piles with a metal detector will be productive. Some of the known mines located here are the Descanso, Free Coinage, Gold Standard, Good Luck, and Oak Canyon. About 50 miles northeast of San Diego is the Boulder Creek mining district. The first discoveries of gold in this area occurred in 1885, and continued on and off for many years. Gold veins running through quartz rock can be found in this area. Additionally, there are limited placer gold deposits that can be panned from the San Diego River. The San Ysidro Mountains have some small placer gold occurrences is some of the dry washes and gulleys. The main mining activity took place in the Dulzura mining district. The largest mines in this area include the Donahoe, Johnston, and Doolittle Mines. Between the towns of Julian and Banner and to the north central South Diego County lie locations of additional gold deposits. There are long stretches of excellent gold deposits which runs through the Cuyamaca District, Deer Park and Pine Valley districts. Well known mines in the area are Gold King and Gold Queen mines and the Golden Chariot Mine. The veins found here are very thick and range from few inches to about five feet in thickness. Many of the deposits are very shallow here from a commercial miner’s perspective. Surface deposits may be locatable with a metal detector. Julian has become fairly well-known recently as a weekend getaway where recreational panners can pan for gold. The area is easily accessible and is a short 30-45 minute drive from San Diego on the highway. The road extends through curvy and hilly two lanes and is a pleasurable drive. The location offers excellent prospects of finding gold and when coupled with the ease of access, this is a great place where to start prospecting if you are in San Diego County. San Diego County offers a variety of different locations to start prospecting. 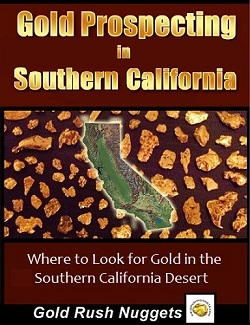 Lesser known locations in this region for gold prospecting are Cuyamoco, Deer Park, Escondido and the Laguno Mountains. Many of the locations are easily accessible via road which makes prospecting easy, while some areas may require some hiking to get to the more inaccessible areas. Hiking into more remote canyons may be worthwhile to access areas that other prospectors have missed. As with many areas in the desert, hot conditions and limited water has prevented extensive mining in many gold-bearing areas. A prospector can still find good gold in many areas today that have not seen significant mining activity for over a century.